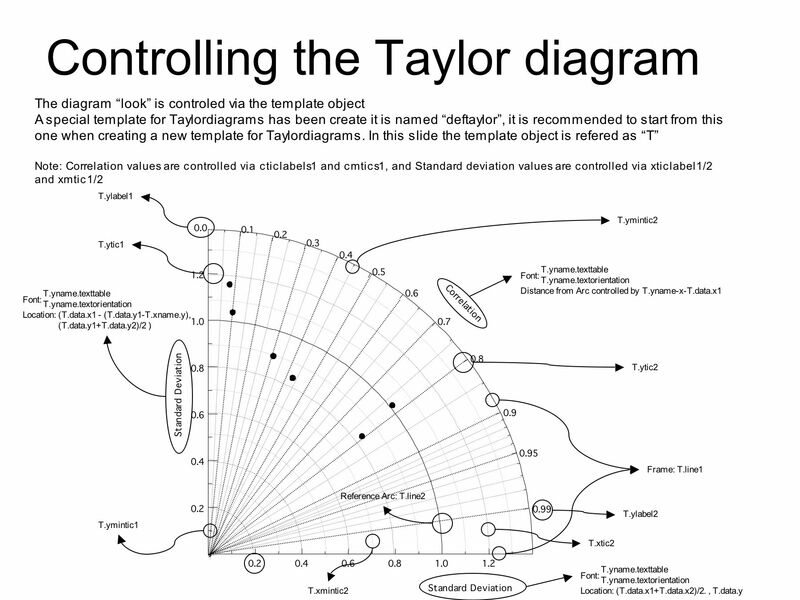 This turorial is for creating Taylor Diagram using UV-CDAT’s VCS. Correlation and standard deviation are required. Here we create dummy input named as “data” for test. data.id = "My Taylor Diagram Data"
Plot the beginning version using VCS module. “vcs.createtaylordiagram” is for creating template. Curved line in the plot indicates a reference line. Let’s’ your reference data (e.g. observation) has 1.2 as standard deviation. You may want to move the line to cross 1.2, as below. You may want to identify dots where they are coming from. You can adjust marker as shape and/or string, and create the legend. “id_colors” and “colors” do not need to be identical. Adjust position of text string to avoid overlapping by using “xoffset” and “yoffset”, which gives relative position from each of (x, y) points. Instead of using for loop and “taylor.addMarker” function, you can store those pre-defined values to the Taylor diagram template directly. Let’s assume that you want to group your data. You can split lines by giving “None” for one of lines. You can add separate legend where you want. - x1, x2, y1, y2: in ratio. Full page width and length are considered as 1. You can add aditional isoline to show additional measure of skill. See Figure 10 and 11 of “Taylor 2001: Summarizing multiple aspects of model performance in a single diagram, Journal of Geophysical Research, 106(D7): 7183-7192”, for details. When you have negative value for correlation you may want to expend your plot to the other side. See Figure 2 of “Taylor 2001: Summarizing multiple aspects of model performance in a single diagram, Journal of Geophysical Research, 106(D7): 7183-7192”, for details.